Lately on an S/4 HANA Implementation project I came across a weird payment terms requirement from sale side and because of it I had to understand standard functionality of S/4 HANA Payment terms and I also evaluated customized options for fulfilling the requirement. But eventually I managed things with standard payment terms functionality. 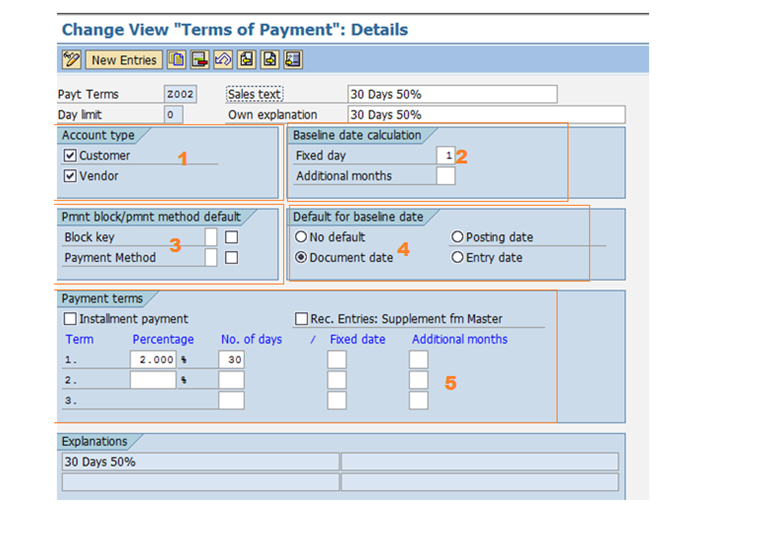 During this evaluation I gained little deeper understanding on payment terms functionality in S/4 HANA. It might be a very small topic but I think worth sharing. So, sharing the same. If it helps even to one my purpose is achieved. a. Fixed Day: It works for base line field. If you put 1 in fixed day field, it will work as base line date will always be 1(first day of the month) irrespective of your posting and document date. Example, your posting date and document date is 20.09.2016, system will bring base line date as current month’s 01.09.2016. Due date will be 30.09.2016 (+30 days) as per above screen shot. b. Additional months: you can fix additional months to calculate base line date. 4. Default Base Line Date: There are four different default date which can be sent to base line date field. a. Instalment Payment: If you are using as instalment payment then this tick must be there. Against this payment term you can assign multiple payment terms in OBB9. Instalment payment terms is put to customer and vendor master or invoices. b. Rec. Entries: Supplement from master: This indicator controls whether the terms of payment in a recurring entry are to be taken from the customer or vendor master record, if no terms of payment key has been entered in the recurring entry original document. c. Terms: There can be three slab. Discount can be given up to 2 slabs and 3 third is due without discount. f. Fixed date: this fixed date work for due date (not for base line date). It always consider next month date. Example, if you put fixed date as 26 and you current posting date is 28.09.2016 and your due date will be 26.10.2016. No of days for due date is adjusted. Example, if you put fixed date as 2 and you current posting date is 28.09.2016 and your due date will be 26.12.2016 (system will automatically put 2 months + 30 days as per screen shot). No of days for due date is adjusted. Note: There is no change in Payment Terms functionality in S/4 HANA, all these functions are/were available in ECC6 and older versions. Since I explored it in S/4 HANA Project that is why I am beautifying it with S/4 HANA words. Otherwise it is the same as earlier. we are able to refresh our knowledge on payment terms. Impressed your final confirmation that here are no changes in Payment Terms functionality in S/4 HANA. Thanks for this summary. Are you aware of how baseline date calculation wrt to public holidays has changed (OR not) in the standard ? Nicely explained with example makes the blog more easier to understand.